The 3DS is no stranger to puzzle games, with Japanese developer Nikoli being responsible for most of the puzzle games on the market. While games like Sudoku, Hitori and Kakuro have provided us with enough numbers to last a lifetime, there’s a distinct lack of wordplay on Nintendo’s newest handheld. Enter Crosswords Plus, the follow-up to the similarly titled DS game from a few years back. Nintendo hasn’t really changed up the formula this time around; the game still offers a bevy of crosswords, word searches, and anagram puzzles to work through. But despite the amount of content the game offers, Crosswords Plus is missing a few elements that prevent it from being the standout puzzle game that it (frankly) should have been. Of course, the game’s biggest draw is the wide selection of puzzles. There are over 1,000 crossword puzzles to complete, which vary in size and difficulty as you progress from easy to medium, hard, and so on. Unfortunately, the game’s easiest puzzles are ridiculously short and shallow, and you are forced to complete them in order to unlock more challenging ones. This level structure applies to the entire game, with entire modes being locked out until a couple of days have passed. The developers use the same touch-screen interface from past games, and it’s intuitive enough to pick up and learn within a few minutes. You’re able to zoom in and out of a puzzle with a simple tap of a button, allowing you to focus on specific sections or the entire puzzle. The handwriting recognition software works fairly well, though a few quirks pop up every so often (you’ll want to make sure to close the loops on ‘R’s). 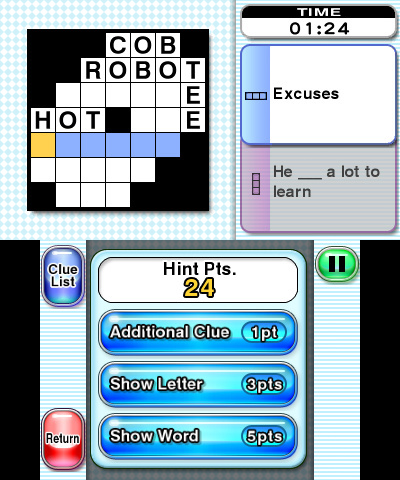 For those who need it, there is an in-game hint system, which can provide you with an additional clue to help solve a word, or automatically fill in letters and words if you see fit. If you grow tired with the selection of crosswords, you can always try a hand at word search and anagram puzzles. Word searches work as you would expect them to, with each puzzle having a specific theme. Anagrams have you unscrambling letters into words, which controls easily enough with the stylus. 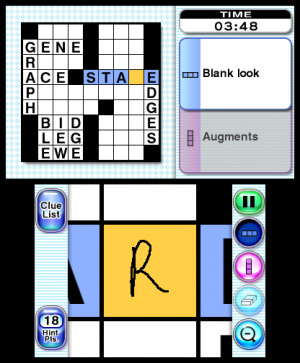 While the anagrams provide more challenge than word searches, the game includes some rather archaic words as part of each puzzle, which can make things tricky. An additional mode comes in the form of Word of the Day puzzles, which are insultingly easy. You’re tasked with coming up with words that start with a letter from the previous word, which offers little to no challenge. Unfortunately, the game’s biggest issue is with its presentation and design. While one wouldn’t expect much from a crossword game, the graphics and music leave much to be desired. The 3D effect in menus is worthless, and the game doesn’t do much to add any flair to the stale visual experience. The music doesn’t fare any better, with only a handful of repetitive tracks to keep you company. Unlike other Nintendo titles such as Pushmo and Picross 3D, there is a noticeable absence when it comes to past franchises. You won’t be solving any Mario or Zelda-themed puzzles, and there is no option to create or share any of your own. 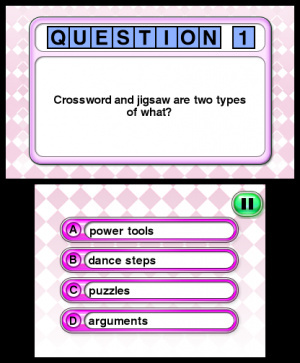 While there are downloadable puzzles offered through SpotPass and StreetPass, they don’t stand out from the thousands that are already included from the start. Crosswords Plus’ biggest flaw is that it sticks too close to the formula that was hammered out by its predecessor. While the core gameplay is as solid as ever, the lack of additions and improvements make for a game that gets old very quickly. It’s a by-the-numbers experience, and feels like one that should have been a budget eShop title, as opposed to a retail title that costs more than its virtually identical predecessor. Crossword fans might find some value, but those who aren’t dead set on word-based head-scratchers can do a lot better, for far cheaper. Disheartening. The game piqued my interest, but pricing was a concern even before reading this review. Maybe I'll track down a copy of the DS release instead. That last picture is begging for you to put Bowser in. Yeah, I really wanted some 3DS crosswords, and was on the fence, and then I saw a used copy of its predecessor in a store, and just got that for maybe $10 instead of a whopping $30. Definitely satiated my appetite for a fraction of the cost. If this had been sold for less, I would have gotten it digitally. Alas. I was going to get this but then I thought naaaaaah, angry birds trilogy instead, FTW. But i'll still be getting this for christmas since I like Crosswords. I had a feeling this one would get scored low, but its turned out to be one of the games I can't put down and I'm addicted to since I downloaded it. I would give it a 7 or 8 out of 10. As a huge Word puzzle lover, it suits every need I have. I don't need 'bells and whistles' to thoroughly enjoy a word game. It improves upon its predecessor by adding word search and spotpass puzzles and the word of the day features. Great game if you ask me! I've never been great at crosswords and I found this one ridiculously easy. How do you unlock hard and expert, anyway? Lower the price to five bucks and I'll get it. A crossword book at the local pharmacy has almost 1000 puzzles for five bucks. Because its on the 3DS I'll be generous and let them charge seven bucks. 30 bucks is a kick in the seeds. How many of the other puzzles (not crosswords) are included? Do you have to do crosswords to unlock the other puzzle types (since the review mentions unlocking)? Wondering as I don't do crosswords, but if there are enough of the other kinds of word puzzles I might go for it as a download, and get the DK title on the side (either this or Layton, which I may purchase as retail after all). @Mega This didn't get a bad review. @Mega Neither did Art Academy. @Barbiegurl777 Thanks, that was helpful. Guess that means I can't avoid the crosswords entirely, maybe just a few at the start. Since I don't play crosswords (but will go for other word games like anagrams), I was trying to get a sense of how many of the other puzzles are included, e.g. if the majority were crosswords and the other types were added as an afterthought (the selling point is crosswords, after all), compared to a nice chunk of say 50+ puzzles each in the other modes. I might get this as a quick play type of game. Thanks again. @Mega A 6/10 isn't a bad score, it seems more like an average one rather than a bad one to me. In my opinion I would give this game a 7. It's not the greatest game, but it is a nice way to make the time go by on a long car ride or to just relax and solve some puzzles. I see it as costing $20 again and paying $10 for Donkey Kong. @ecco6t9 Crosswords Plus will run you $30... unfortunately it does retail for more than Crossword DS did. seriously, if you really want this title, despite the plethora of other options for satisfying that crossword itch, try the DS version, it's bound to be cheaper or free to try and there's little difference. sadly there's more problem than plus with this game. the anagrams are IMPOSSIBLE and give you NO HINTS, the word search can't be viewed full screen and you have to search for backwords words (always a bummer). both of these feel like a cheap afterthought. and yes, the initial crosswords are so easy that they are boring, but you have to do them in order to open up more and there are 8-Zillion of them you have to do before it gets even remotely interesting or challenging. as someone who loves crosswords, count me disappointed. this game could have been sooo much better with a little more thought put into it. @ouroborous Yeah, as you can probably tell from my review, the anagrams were a misstep in my opinion. The lack of hints makes for a tedious time. I would have much rather seen something more akin to Boggle, where you use a pre-set grid to try to find as many words within a specified amount of time. 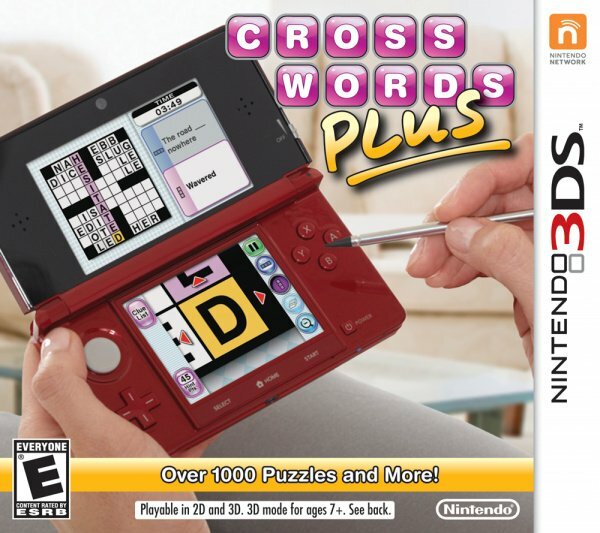 I'd love some crossword puzzles and stuff on my 3DS, but I don't want to spend $30 unless it's really something great. @ecco6t9 That is one crappy price for Donkey Kong. And yeah, I have no interest in this game whatsoever. People keep talking about Crosswords Plus being a rip-off for $29 (and you get a digital download of Donkey Kong Original Version, too).. Back in the day, many games in the 80's for the NES and beyond cost upwards of $40-50. Considering that was 30 years ago, this is a great value for a 3-D Crossword game in 2012 (and a Donkey Kong game, to boot) in my opinion. Mario Golf, which was just re-released today via the e-shop for 3DS cost $30 back in the day, too. Look back at history before you make judgments about today's prices and standards of value for money. @KneehighPark I totally disagree. The anagrams were not a misstep, I enjoy playing them. As a huge word game lover, this is the perfect package of word games for young and old alike. I feel your review sells the game a little short. If you play the game enough, you do start to see Mario references here and there, too. There's a 'Nintendo' themed crossword puzzle, too, I just played. If everything were Mario themed, I think I would probably want to jump out a window. So true. I'd give this game an 8/10. I thought it was fantastic all around. "I don't always play crosswords. But when it do, I play Crosswords Plus"
I have to disagree with this review. I have been enjoying this game quite a bit since I've downloaded it. It has a ton of puzzles and a very good variety. I even enjoy the "word of the day" feature. I am usually quite the bargain shopper but I honestly believe this was $30 well spent. @photofool83 Totally agree with you. I believe this review was pretty bad. I'd give this game an 8/10. You can go to any thrift shop and get these pencil puzzle magazines for 25 to 29 cents. I never got why people would spend more then 5 dollars for a game like this. Also a magazine you can just skip the easy sections. I understand the Nikoli games but Crosswords or Wordsearch? No. @grumblegrumble How far into the game is the Nintendo themed puzzle? I thought this was a fine game. It didn't go too far above and beyond what the title promises to be, and there is loads of content and puzzles to solve. The hard puzzles are huge and will take a lot of time to solve. This game is now only $6.99 used at GameStop and it worth it for crosswords fans at that price.